The Dutch government has recently published a bill to expand the current VAT adjustments requirements for ‘capital items’ where the taxable use of the items in question changes over the capital items adjustment period (currently nine years for immoveable property and four years for certain tangible capital assets). 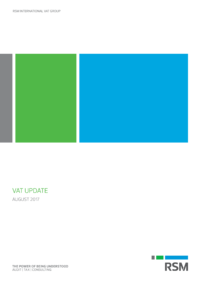 Changes to the VAT adjustment rules are expected to take effect from 1 January 2018. From that date the value of ‘capital services’ will need to be included in any adjustments (such as renovations and refurbishments) in order to prevent unacceptable tax avoidance.